Empath Tools 101 — Love. Heal. Thrive. Do you struggle with being around crowds? After a day spent around family, do you find yourself more emotional, exhausted and depleted? After consoling a loved one, do you find yourself just as mad/sad/upset as them an hour later? It happens, but it doesn’t have to. I've been teaching Empath Tools 101 for quite some time. I love it! It is such an eye-opening,awareness building class! It's been so incredible that I recorded an on-line version. 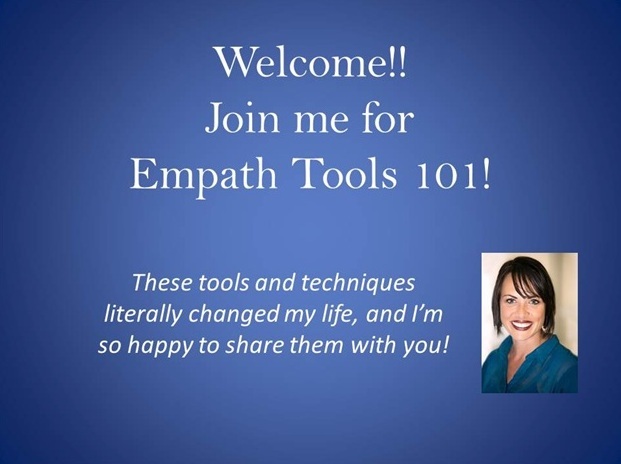 I created Empath Tools 101 to change your life and change it quickly because I know how it feels. This 1-hour intensive course (49 minutes to be exact!) was born from my own desperate need for this very course. As you may already know, I published Angel Birthdays several years ago. It’s a children’s grief healing book that repositions the day we lose a loved one as an Angel Birthday. Well, as you can imagine, I gave many grief talks and workshops for adults and parents. At my very first event, all the attendees came up and wanted me to sign their books and listen to all of their grief stories. I felt honored to witness their stories and offer healing suggestions. After all, this is why I wrote this book…to help heal grief. But what happened next is something I would have never expected. The next day, I couldn’t get out of bed. I wasn’t sick. I had no cold symptoms, no flu symptoms, no fever. I realized later that I had an energy hangover. I had taken on so much of the attendees’ energy and emotion that I literally couldn’t even get out of bed! So I started reading, listening to podcasts, and met with every single spiritual counselor I knew to find out exactly how they protected their own energy when people shared their stories and pain with them. It was fascinating, and the answers I collected reached a broad spectrum of solutions. Now, I have my own step-by-step process that I will teach you in this 1-hour intensive that will help you protect your energy, emotions and life and help you to feel empowered, strong and self-assured in yourself and your God-given gifts. Students who have taken this course have shared so many great stories of how these tools have changed their entire lives. “Wow! One hour of powerful, enriching, healing learning. I watched these videos with no knowledge of chakras or auras or grounding, and by the end, was able to use the tools to protect myself in an ongoing stressful situation. I can’t recommend this enough.” ~J.R. “I want to thank you for giving me the tools to help me protect myself! It really works, and I just wanted to share. I went to a company event this evening where over 200 people were expected. I used all of the techniques I learned in class, and this helped me tremendously throughout the evening. I usually get overstimulated, but I was totally fine. It feels so good to have control and not feel like a helpless victim anymore.” ~ Irene C.
“Empath Tools 101 was a fascinating class where I was able to learn more about my energy and how to protect it. During this class I was given tools on how to protect myself around toxic people and crowds, participated in various activities of physically “seeing” energy, and I was even able to see my own aura. Erin is a lovable, gentle teacher and was happy to answer any questions we had! I highly recommend this class to any and all who are curious about energy!”~ Emma V.
This is one of my very favorite courses to teach because so many people believe they must be a victim to their energy sensitivities. This course is empowering and full of technique and will help you realize your energy sensitivity is one of your greatest assets. In 1-hour you will go from feeling helpless in crowds to feeling full-of-life, powerful and prepared for any situation. I have made this course powerful, efficient and impactful. You will literally change your life in an hour. I can’t wait to hear how these tools help you and how they help you live a life filled with self-assurance, power and confidence! I look forward to sharing all of these great tools with you soon!